Renowned synth designers Elektron have recently unveiled a new flagship instrument, the Analog Keys. “The Analog Keys is a four voice polyphonic analog synthesizer, capable of generating the finest basslines, chords, leads, and sounds imaginable. The Analog Keys is tailor-made for the stage. The 37 semi-weighted keys of the keyboard give instant fingertip control of the analog tones. The special performance mode offers direct access to user-defined parameters, and the joystick, capable of controlling up to fifteen parameters, allows for extreme morphing of sounds. Compatibility with other instruments is well catered for. Simply press a button to transform the Analog Keys into a MIDI keyboard, ready to control external MIDI gear. Thanks to the dedicated CV sequencer and the CV/Gate and DIN sync outputs, analog instruments of both today and yesteryear can be played, sequenced, and controlled with precision. Use the multitude of control options to breathe new life in vintage and modern rigs alike.” Read more at Elektron and hear audio clips below..
“While most of the mobile music-making community is currently focused on Apple’s iOS products, Detune has decided to do something different by releasing the Korg M01D, a recreation of the classic M1 workstation for Nintendo’s 3DS.” Read more at MusicRadar. 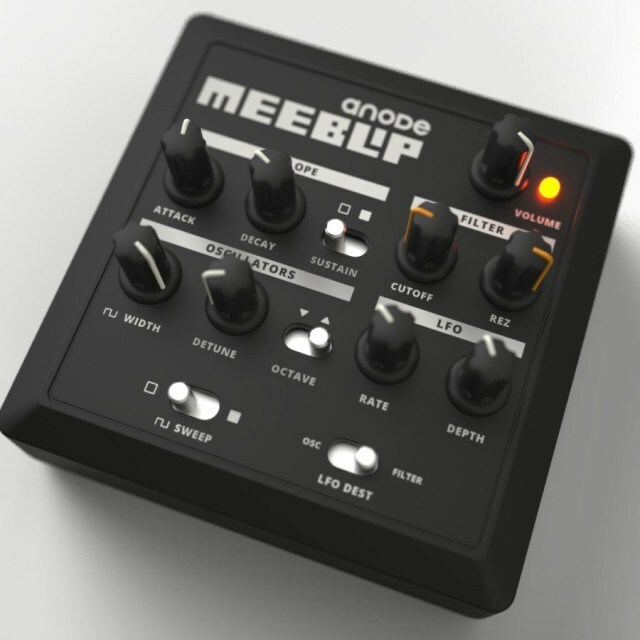 “Canadian electronics company Blipsonic and Berlin-based website Create Digital Music have introduced their latest joint venture, the MeeBlip anode – a compact bass synth, complete with an analog filter. The anode is a hybrid analogue/digital instrument, featuring digital pulse oscillators with pulse width control – based on those found in the original MeeBlip – alongside a three-stage envelope, a LFO and an all-analogue filter with resonance control.” Read more at Synthtopia and hear clips below. Read (and hear) more at Create Digital Music. “We dreamt of a really simple DIY kit – so simple that it would allow beginners to enter the world of DIY with a big smile – and yet, interesting enough to be useful in any kind of Eurorack setup. That’s how the CVpal was born. The kit contains only 25 parts to solder; but is an incredibly useful tool, allowing you to connect your computer or iPad/iPhone (with camera connection kit) to your modular system or (neo-)vintage analog equipment. The CVpal features a large palette of control modes: monophonic with velocity and extra square oscillator, monophonic with clock outputs, duophonic, dual monophonic, or even quad trigger conversion! Its 12-bit DAC with an 8-point software calibration curve makes it more accurate than more expensive products.” Read more at Mutable Instruments.